501, Drum Machine from M.F.B.. The BAR is a simple extreme. This is what is most basic in terms of sound quality, that is not much. Sounds: puck, pop, tic, tac, chee chee ... kumfffff! 9 switches managing the perceived sounds on two positions. 1 switch trigger 3 positions. 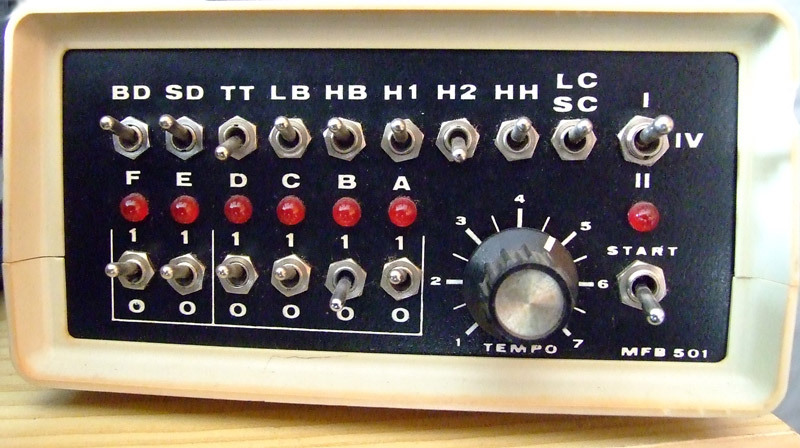 One tempo potentiometer graduated from 1 to 7 (hard to determine the value of tempo). 1 right channel (R) or mono. BAR is the stereo (a luxury given the sounds!! 1 input to trigger the start 501 from a sequencer or a pedal. Two triggers in and out for ^ be driven by a sequencer or synthesizer. 1 and ends with mono jack 3.5 for supplying 12 volts. see the photos the look is very retro, kind of boîtierplastique white, found on the shelves of DIY to make connections. electronic architecture is based on a single motherboard or is welded on. Operation is simple, the BAR is provided with a booklet giving different rates depending on the position 1 or 0 of switches 6 and 9 switchs perceived. No memory is useless position switches. I opened the case, one can triturate rigor small adjustable resistances to change the height of the perceived stamps! But no more. As stated above, the sound quality is the rendezvous of those who seek small noises a child could do with his mouth. 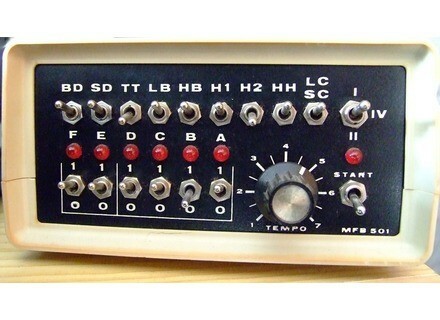 I acquired it in 1980, this is my first BAR which allowed me to control the time of my analog synths. This really has cost 900Fr really an entry price range. Again this choice? Well no, it does not exist, it is a collector this is on! Resell: but who wants us daily? It is very Kisch. I keep it as this will concern all those who come to see me. "What is it? Did you remove the dashboard of an old cobbled R12?, This is a kit TANDY or what?"